Click the button below to add the Grip-Rite 9-Gal. 3 HP Portable Powered Wheelbarrow Electric Compressor to your wish list. 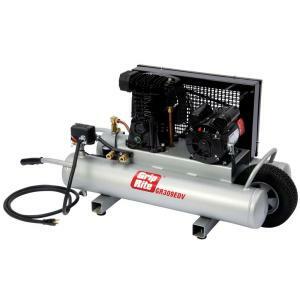 The Grip-Rite Dual Voltage GR309EDV 3hp (peak) Electric Wheelbarrow Compressor provides 9 gallons of non-stop air at 7.2 CFM to keep the most demanding contractor crews working all day, every day. The GR309EDV compressor features a 3hp (peak) engine and rugged compressor pump and cast iron cylinders. Grip-Rite has also thrown in a two-quick-coupler manifold (with port for one additional coupler), heavy-duty 3/8 in. regulator for increased airflow, and a 10 in. no-flat tire. The heavy-duty pump features an easy-view oil site gauge to easily check the oil level and prevent damage due to low oil. The durable GR309EDV is backed by a bumper-to-bumper 12-month warranty. Specs are as follows: 3.0hp (peak)/1.5 HP (running), 6.0 CFM @ 100 psi, 9 gallon tank, On/Off: 95/125.